Pub­lic trans­porta­tion is an impor­tant tool for reduc­ing air pol­lu­tion, energy con­sump­tion, and green­house gas emis­sions. By pro­vid­ing an effi­cient and con­ve­nient pub­lic transportation sys­tem, Howard County helps the envi­ron­ment, pro­vides an eco­nomic way for peo­ple to com­mute to work, and pro­vides trans­porta­tion options for seniors and peo­ple with dis­abil­i­ties. Other local pro­grams pro­mote car­pool­ing, pedes­trian and bicy­cle pathways, and effi­cient trans­porta­tion planning. Indi­vid­u­als can save energy and money by keep­ing engines tuned up, keep­ing tires prop­erly inflated, and avoid­ing rapid acceler­a­tion and brak­ing. Car­pools and pub­lic trans­porta­tion are even better. Elec­tric Buses. 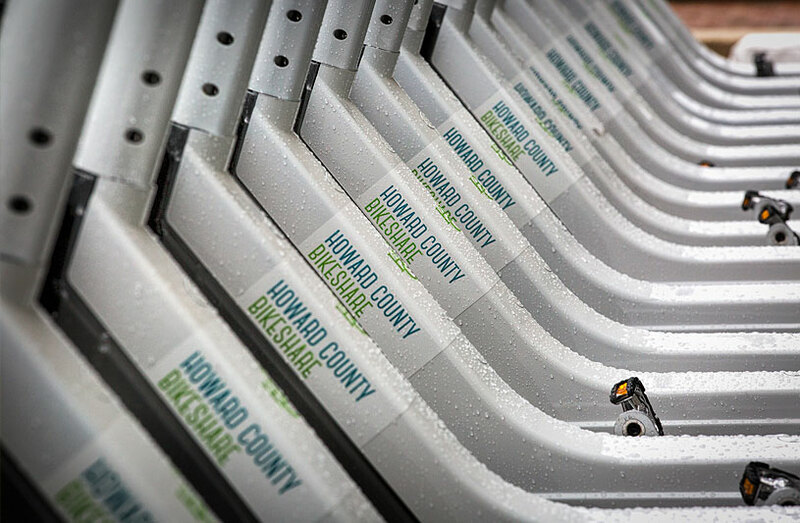 Howard County received a fed­eral grant to add three full-size, light­weight elec­tric buses to the Howard Tran­sit fleet for use in and around Colum­bia. These new buses are pow­ered by an induc­tive charger that pro­vides energy to the bus bat­ter­ies through electromagnetic induc­tion. In other words, the bat­ter­ies are re-energized with­out hav­ing to be plugged in. The induc­tive charg­ing sys­tem, which looks like a large pad that the buses park on top of. 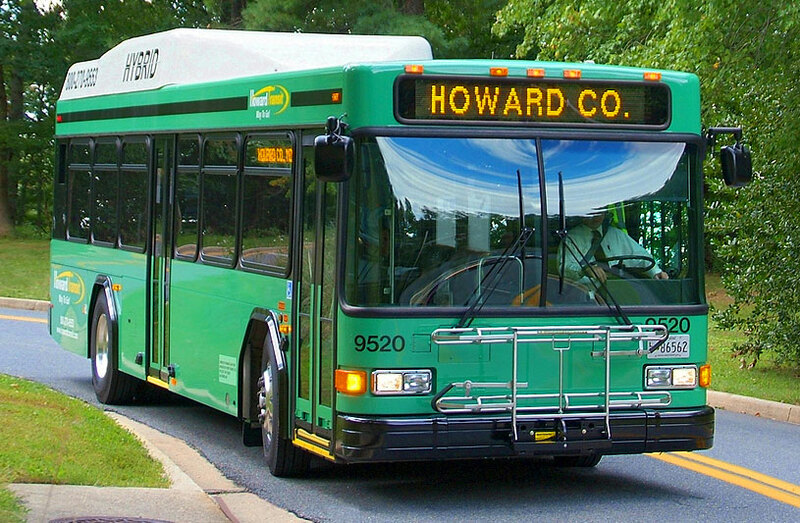 The buses oper­ate on Howard Transit’s Green Route which is the most heav­ily used line. For more info visit transitrta.com/electric. Regional Trans­porta­tion Agency of Cen­tral Maryland. RTA pro­vides daily bus ser­vice in Colum­bia, Elli­cott City, Sav­age, and other loca­tions in and around Howard County. For infor­ma­tion on fares, routes and sched­ules, please visit the RTA web­site. RTA Mobil­ity. A curb-to-curb, shared ride trans­porta­tion ser­vice for rid­ers who are unable to ride RTA fixed route tran­sit sys­tem due to a dis­abil­ity or age. Learn more at transitrta.com/paratransit. MTA Com­muter Bus. The Mary­land Tran­sit Admin­is­tra­tion (MTA) pro­vides con­tracted com­muter bus ser­vice from within Howard County to Bal­ti­more City and Wash­ing­ton, DC. Many of these buses meet at park and ride loca­tions. Sched­ules are avail­able online at the MTA’s Web site. MARC Train. The Mary­land Area Regional Com­muter (MARC) train ser­vice is a 187-mile com­muter rail sys­tem man­aged by MTA. MARC trains pro­vide ser­vice through Howard County to Bal­ti­more and Wash­ing­ton with 5 sta­tions in Howard County on the Cam­den Line. Sched­ules are avail­able online at the MTA’s MARC Web site. Carpool/Vanpool. Car­pool­ing or van­pool­ing can save money by reduc­ing vehi­cle fuel and main­te­nance expenses. It can also con­tribute to reduc­ing traf­fic con­ges­tion and air pol­lu­tion. Con­sider find­ing some­one in your office to share a car­pool or van­pool and save a lot on gaso­line pur­chases while help­ing the envi­ron­ment. The Mary­land State High­way Admin­is­tra­tion has 12 Park and Ride loca­tions in Howard County and many more through­out the state to help facil­i­tate car­pool­ing. Guar­an­teed Ride Home. This pro­gram offers a free ride home to com­muters who reg­u­larly (at least twice a week) travel to work by mass tran­sit, van pool, car pool, bicy­cle or by walk­ing. Reg­is­tered com­muters can get a free ride home for unsched­uled over­time or per­sonal or fam­ily emer­gen­cies. This offers flex­i­bil­ity and peace of mind that they can get home if they need to. The Guar­an­teed Ride Home pro­gram offers reg­u­lar com­muters a free ride home up to four times a year in a taxi or rental car, depend­ing on the commuter’s home loca­tion. To be eli­gi­ble, com­muters must reg­is­ter in advance and must renew their reg­is­tra­tion annu­ally. For more infor­ma­tion, visit the Com­muter Con­nec­tions webpage. Pedes­trian Plan. Howard County’s Depart­ment of Plan­ning and Zon­ing has devel­oped a pedes­trian plan and as of 2018 is work­ing on updat­ing it. To learn more, please visit the Walk Howard web­site. Howard County also has a Tran­sit and Pedes­trian Advi­sory Group. Driving cars and trucks comprises the majority of transportation in our region. Effective transportation planning can help to minimize traffic congestion and air pollution. Howard County coordinates transportation planning efforts with the Baltimore Metropolitan Council and the State Highway Administration (SHA). Howard County also participates in the Baltimore Regional Transportation Board (BRTB). The mission of the BRTB is to provide regional transportation planning and policy making for the Baltimore region. Keep your car maintained and tires full to make the vehicle as efficient as possible. Avoid­ rapid acceler­a­tion and brak­ing. Carpool, bike, or walk whenever you can. Combine trips for errands so that the trip is more efficient.